Don't you just love when you are checking on all of the fantastic blogs that you follow and someone tells you about a blog that they follow that you weren't aware of yet?!! Then to make things even better it turns out that that blog is written by a teacher of the same grade level as you. Then the absolute cherry on top of the whole experience is that the new (to you) blog is having a giveaway!!! Well that's what just happened to me. 4321...TEACH just blogged about how Lindsay at My Life as a Third Grade Teacher is having a 600 follower giveaway. After checking out the goods up for grabs in this giveaway I decided I just had to follow her blog and then of course tell everyone else about her blog and giveaway. Are you ready, the giveaway includes: Katie from Adventures of a 6th Grade Teacher is allowing you to pick any three products from her TPT store. Amber at Adventures of a Third Grade Teacher is giving away her Common Core Vocabulary for whatever grade level the winner teaches. Stephanie from Teaching in Room 6 has graciously donated her sports themed Goal Setting Pack. Chrissy from Buzzing with Ms. B is allowing the winner to pick any product from her TPT store. Kristen over at Ladybug's Teacher Files will give the winner a copy of her Mini Lesson Materials for Reading Genres. Mor from A Teacher's Treasure has donated her Interactive Student Notebook file. Laura from Will Grade for Coffee will allow the winner to pick any two products from her TPT store! 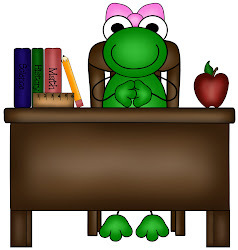 Finally, Lindsay is going to donate her Reading Workshop Inserts and her Getting Started with Writing Workshop Handouts. Can you believe it?!? So what are you waiting for, go check it out. I have a feeling you won't be sorry!!! Have you heard about Take a Penny? No, I don't mean the coin tray at the gas station-this is a subtraction strategy that can be used when students are trying to subtract across zeroes and are having difficulty with the regrouping. Take a Penny is another great Pinterest find but I also found the original blog with a more detailed explanation of how and when to use this strategy. if you get a chance to look over the strategy I am curious what you think? I know that subtracting across the zeroes can be EXTREMELY tricky . . . but I'm not sure about teaching the strategy. I would like to see if the rhyme that I taught my students last year will work first, I think. (You can see the rhyme by clicking here for the Subtraction Success post.) But I'm wondering what do you think? I miss my flip flops! This has been a great first week but man am I tired! To be perfectly honest the fact that I am still awake at ten minutes 'til eight is amazing and possibly a first for my ten years of teaching. I have to say the hardest part about this week for me anyway has been having to wear real shoes again. I know that it sounds silly but I feel like my feet have been so cramped all week. I am actually not sure what I am more excited about for this weekend, sleeping in "late" (past 5 a.m.) or wearing flip flops/going barefoot. What about you, what was/is the hardest thing for you when it comes to your back to school routine? Please share!!! 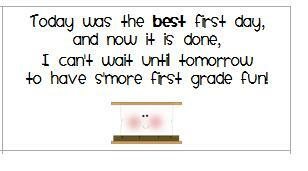 What I did was print the little poem on labels, put the labels on the baggies, and fill the baggies with the treat. I of course changed the grade, added a <3 and my name and decided against the pic. because of a lack of space. This was a HUGE success last year and I hope to have the same reaction this year. I hope that you will find this post useful to you. Happy Saturday!!! First let me preface this with I live in Jacksonville, Florida so this may not be happening everywhere right now . . . Now on for the (hopefully) great back to school sale news! I wanted to give everyone a heads up on a sale that is going on at Office Max right now. This week they have several of their back to school items on sale as you may have seen in the flyer that accompanies the Sunday paper but I wanted to let you know that teachers get an extra 25% (today only) and instead of 5 free composition books with a $5 purchase you can get 20 FREE composition books. They also had a free Office Max vinyl tote bag and I also received a $10 off coupon that can be used at Old Navy with a $50 purchase that is good through August 22nd (almost pay day). Just thought I would pass along my great find. ***You might need their teacher rewards card if you don't already have it but it doesn't take long to complete. Happy shopping!!! Teacher Appreciation Days in your area!!! This week I finished two more of this year's SSYRA books. Both books were fun and light reads and cute for young readers and not too bad for adults either :) If you are looking for a just for fun read either of these books would make good choices! 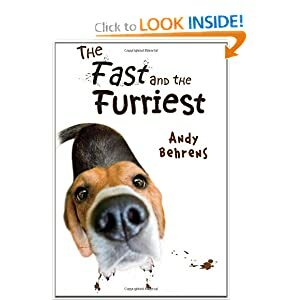 The first book I read was The Fast and the Furriest by Andy Behrens. This is a story about a coach potato boy, Kevin and his couch potato dog, Cromwell that begin training for a dog agility competition after Cromwell accidentally sees a competition on TV. Are Kevin and Cromwell going to be able to train and win the dog agility competition or will their inner couch potatoes take over, you will have to read and find out! This book spoke to me because my dog and I have moments of true coach potatoness. As a warning, the book started a little slow (for me). However, I am very stubborn and very rarely do I abandon books so I persevered and boy and I glad that I did! 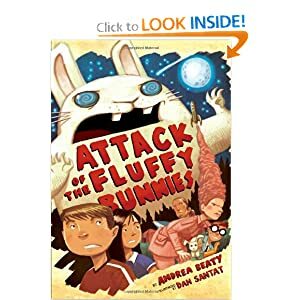 The second book I read this week was Attack of the Fluffy Bunnies by Andrea Beaty. This book is a beginning chapter book with cute illustrations (some of them comic book-ish) and tells the story of the Rockman twins, Joules and Kevin, and how crazy things start happening after they are sent to Camp Whatsitooya. This book is a little outrageous in a silly way but still cute and I think my 3rd graders, especially the boys, will like it so it might even make it on to the class read aloud list. We'll see. If you are looking for other great reads head on over to The Teaching Thief for another installment of Fiction Friday. Just as a warning, each week I find more and more books to my must read list. Of course in my book this is not a bad problem to have :) Happy reading!!! I can't believe how quickly the summer has flown by! Don't misunderstand, I love my job, but there are several things that I will miss from my summer vacation. This is why it is the perfect time to link up with Miss Trayers over at Not Just Child's Play. So here is my list of the things that I will miss once school starts. 1. Spending time with my hubs and dog during the day-I can't actually do anything about the day part but I can do better with the after school and weekend times. I have enjoyed meeting my husband for lunch and playing outside with the dog before it gets too hot. This is why this is one of my resolutions for the new school year-wish me luck! 2. Sleeping in-my alarm goes off at 5:15 a.m. on school days, yikes. Even though I have probably only slept in past 8 a.m. a handful of days I am not looking forward to setting the alarm to go off before the sun even comes up! 3. Staying up late-OK so there isn't anything all that great on TV late at night, but it is nice to know that I can stay up and watch if I want to. I always feel like I'm missing the good shows during the school year because of my VERY early bedtime. 4. Wearing whatever I want-my school is a fairly casual school but this summer I have worn shorts, tank tops, flip flops (or even no shoes), and even the occasional pair of jeans and not even on a Friday, etc... those are not exactly school clothes. 5. Going to the grocery store in the middle of the day (it's less crowded then). I just got back from the grocery store and I was in and out way more quickly then I would have been on a Saturday or a Sunday or even after school. So what about you? Do you have a list of things that you will miss once you get back to school? If so, link up with the party. ***Having trouble linking-this may be on hold . . .
Oops! I forgot a giveaway!!! I apologize for the double post today but I accidentally left off one of the giveaways from one of the awesome blogs that I follow. I am so sorry Julie!!! 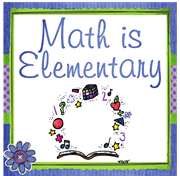 Julie Sawyer from Math is Elementary is also having a giveaway. She has a $25 iTunes gift card that you are eligible to win . . . so head on over to her blog and check it out! While you are there look around and I am certain that you will be impressed with all the great ideas and freebies that her blog has to offer. This morning I was checking up on my blog roll and I found several great giveaways that I wanted to tell you all about, in case you didn't know. The first giveaway is for a HearALL Assessment Recorder. I'll admit at first I was like, a what? But after reading about everything this little thingymabob can do I've decided I would love to have one!!! 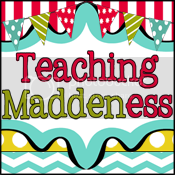 What you need to do to enter for a chance to win is to head over to Amanda's blog Teaching Maddeness. Good luck! The next giveaway that I found is being held by Rebby over at Classroom Compulsion. This is her first giveaway, how exciting! There are three great prizes being offered to the winner of her first giveaway. The prizes include a $5 gift card for Target, (who doesn't LOVE Target?!?) $10 worth of free stuff from her TPT store (love it) and Misty over at 3rd Grade's a Hoot has added her Owl Classroom Decor Pack to the giveaway (jackpot!). Can you believe I'm not done yet?!? Nope, still one more giveaway to gab about (hence the title Giveaways Galore!) Mary Pitner over at Pitner's Potpourri is celebrating her first blogaversary with a tremendous giveaway. With the help of some friends and fellow bloggers she is giving away so many great items I'm not even sure I can list them all so you just need to check it out for yourself! I think those are all of the giveaways going on right now (at least by the blogs I follow). If you know of any other really awesome giveaways you can leave me a comment to tell me about them. If you don't leave me a comment I'll know it's because you are trying to increase your odds of winning and the competitor in me will totally understand :) Just kidding! Wishing everyone a wonderful Wednesday!! !